Amazon’s new Echo ($100) is smaller, contains new microphone technology, and boasts better sound. The old Echo form factor has been remade into the Echo Plus ($150), which comes with a built-in smarthome hub. It’s not very good. Don’t get me wrong, it’s a clever idea to combine two smarthome devices into one unit, especially if your smarthome is piling up as it is. But the Echo Plus’s built-in smarthome hub just doesn’t do a good enough job to justify it. Let’s talk about why. For starters, it’s more like half a smarthome hub. There are two major open smarthome protocols that most devices use: Zigbee and Z-Wave. Any smarthome hub worth its salt supports both. The Echo Plus only supports Zigbee. Are you kidding me with this, Amazon? The fact that Amazon stuffed a smarthome hub inside the Echo Plus but didn’t include support for an entire protocol—when nearly every other hub does—would be laughable if it weren’t so frustrating. Granted, you might be able to find a ZigBee equivalent of a given Z-Wave smart switch or sensor. But you’ll have less choice in which smarthome products you buy, especially given Zigbee’s prevalence. It makes no sense for the Echo Plus’s smarthome hub to only support Zigbee. This, in my opinion, makes the Echo Plus a non-starter. One of the big benefits of a smarthome hub is being able to control everything from one central app. When it comes to the Echo Plus, that means using the Alexa app, which is…not great at it. 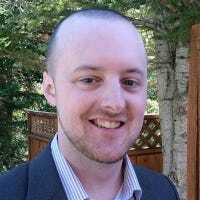 Of course, since you have Alexa at your disposal, you’ll likely use your voice to control your smarthome a lot of the time, but for those moments where you want to control devices from your phone, you would have to rely on the Smart Home section of the Alexa app, which just feels half-baked for this purpose. For one, you have to jump through menus to get to it, and once you get there, nothing is really in order or organized in any way. Once you do finally find the device you want to control, it’s pretty sloppy and laggy. For example, Hue lights don’t update in real time when you change the brightness until you lift your finger off the slider, which makes it more cumbersome to quickly find a brightness setting you’re happy with. And sorry, you can’t use the Hue app instead, since this whole thing assumes you’re using the Echo Plus as the hub and not the Hue Bridge. 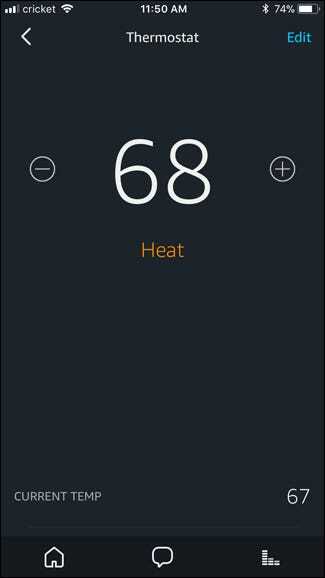 Let’s use my Ecobee3 smart thermostat as another example. I have it connected to my Wink Hub, as well as the Echo Plus. 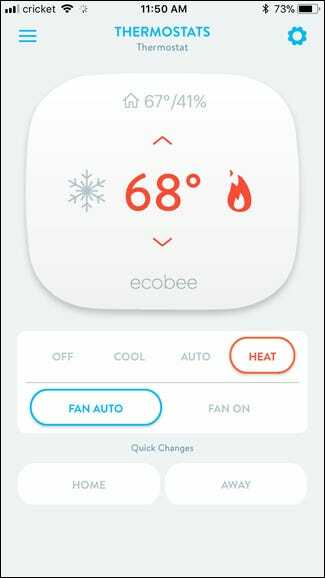 In the Wink app, I can change the temperature setting, turn the thermostat off (or change to heat/cool), control the fan, and enable or disable Home and Away Modes. In the Alexa app, however, I can only change the temperature setting…and nothing else. Useful, huh? Overall, the Alexa app just isn’t made to be a smarthome-controlling app—it’s meant to be a companion to Alexa’s voice control. So if you do plan to get the Echo Plus, you better make sure that you’re okay with strictly using your voice to control everything. Never mind that in-app control is pretty bad—functionality in general is severely limited to begin with. For starters, it doesn’t support nearly as many devices as other smarthome hubs do. In fact, take a look at what all the Echo Plus supports and you’ll notice it’s only a small handful of bulbs, switches, outlets, and locks—forget about motion sensors, open/close sensors, and pretty much anything else. Furthermore, the Echo Plus doesn’t let you customize, program, or automate any of the smarthome devices connected to it. With any other hub, you can do things like have the thermostat turn off if no motion is detected after 30 minutes, for example. That’s one of the most useful parts of having a hub. but with the Echo Plus, you can really only turn devices on and off, change the brightness of lights, and adjust a thermostat. Amazon’s marketing would have you believe it replaces other hubs, but it really doesn’t. Amazon heavily touts the ability to bypass the Hue Bridge altogether and connect your Hue bulbs directly to the Echo Plus, but in doing so, you lose a ton of functionality, including being able to use the Hue app. Whether by using your voice or the in-app control in the Alexa app, you can only turn on and off Hue bulbs and change their brightness—you can’t create scenes, routines, or use geolocation to auto-control your lights. Philips even mentions on their own website that you’ll get way more functionality out of your lights if you use a Hue Bridge. What irks me the most, though, is that Amazon says color Hue bulbs can be connected directly to the Echo Plus, but you can’t even change the color of the bulb from the Alexa app. And since you can’t use the Hue app in this scenario, you can only use your voice to change colors. Way to go, Amazon. Granted, not every smarthome device that’s connected to the Echo Plus is this limited, but it’s pretty disappointing that you might not be able to get full functionality out of a product if you use the Echo Plus’s built-in smarthome hub. The Echo Plus comes with a built-in smarthome hub on top of what you already get out of a regular Echo, so surely you’re saving money by not having to buy a separate smarthome hub, right? Well…not exactly. For starters, the built-in smarthome hub functionality is costing you an extra $50 compared to the regular Echo (which can be had for $99). Granted, buying a smarthome hub by itself can cost you as much as $100, but you can easily get a SmartThings or Wink hub used for way less on eBay. At that point, you’re not really saving any money by consolidating your Echo and smarthome hub. Plus, even if you do end up saving a bit of cash, you’re giving up the functionality that I talked about in the previous section. So what you save in cash, you’re adding in some headaches. I’ll be fair here: if you’re slowly dipping your toes into smarthome and aren’t looking into getting all the bells and whistles just yet, then the Echo Plus might work alright. It can be a fine way to learn the smarthome landscape. But if you’re at all serious about smarthome—or ever plan on expanding beyond a couple devices—you’re better off with a dedicated smarthome hub from the likes of SmartThings or Wink. Not only will you get more functionality out of your connected devices, but the in-app control will be way better. Plus, you can still connect these smarthome hubs to any Amazon Echo and use voice commands to control them. It’s a win-win situation.